After years of experimenting with the mixed technique I have confirmed two things. I love glazing; and too much glaze absolutely kills oil’s refracting light. Thus I have often, even repeatedly, found myself at cross-purposes. Most of my experiments in the recent years have been attempts to preserve this light. Painting backwards is one of my more notable successes. However, reclaiming the white of the original panel through painting backwards doesn’t really work tactically speaking if the neighboring areas of paint have been worked-up. And adding it back at the finish line (like I did here) is OK but you can’t always guarantee that the surface will accept it by then or that the light so added will be integrated in the way you want it to be. I needed light within the painted surface, a reintroduced light, applied within and over the developing image. And of course it needed to be lean enough to bear a layer or two of glaze. How did the old masters accomplish this? Tempera white. What is tempera white? Basically, white pigment (I use zinc white but the old masters most probably used lead) ground up in a very lean egg/oil emulsion. The emulsion I use comes from the mixed technique but one could just as easily substitute an egg yolk for the methyl-cellulose glue component. I have used this tempera white before for reintroducing light values within each layer of colored glaze when developing an image chromatically. For examples see: I am curious yellow, Seeing red, and I’d rather be blue. 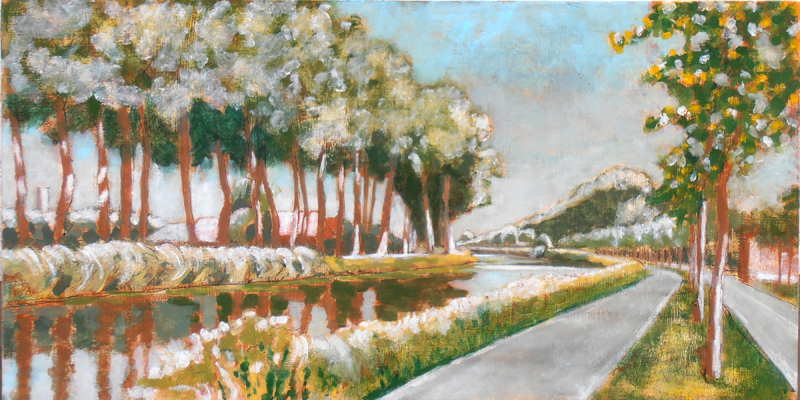 But in all previous attempts, I did not introduce tempera white directly over the egg tempera/imprimatura underpainting, from the get-go, so to speak. That’s what I wanted to do this time, as doing so can free me from any pre-conceived plan of chromatic image development via glazing. So I’ve been working on a landscape of a farm on the Dammevaart just outside of Bruges. 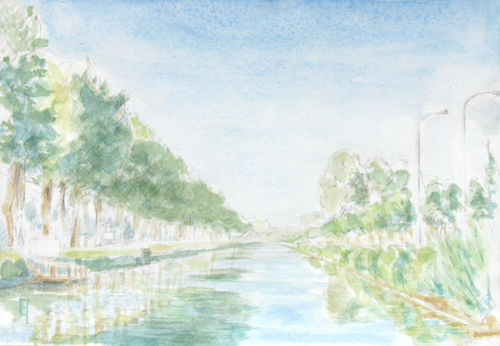 I created a watercolor study of it a few years ago. 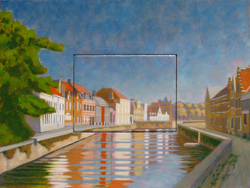 This functions for the basic composition, color relations and light study. Based on this watercolor then, I transposed the design to a gessoed panel and worked it up in silverpoint, which tends to be very light valued. I then laid in light areas of color via egg tempera, anticipating the colors to come. Sorry, no picture of this stage is available (but just imagine the watercolor laid in over the silverpoint drawing and you won’t be far off). My interest for the ET level was stating color relations but keeping them as just hints – not fully developed and certainly not saturated. I let the ET fully dry and oxidize for a few weeks before laying in a toned (burnt sienna) imprimatura. Sorry, no image is available of this stage either. The imprimatura acts like a very lean glaze, bringing everything into relation through its hue and tonality. But additionally it also places an inevitable veil over all design elements. The already lightly developed composition got flatter and the ET colors were only slightly visible, as though through a tinted filter. What to do? White tempera to the rescue. It helped to reintroduce the forms by stating the highlight and quarter tone values. All my seeming tedious homework from the earlier layers played through. My aim now is to complete the painting with just one session of painting into a glaze. The aforementioned homework should allow me to work quickly, spontaneously and yet accurately. And despite all the detail of the under layers, I don’t aim to create a fully detailed realistic painting, rather my goal is a painting that gives the viewer’s imagination space to wander – even if just a little bit. So stay tuned. Figure Drawing #31. Conté crayon on warm gray pastel paper. Back in the seventies when I was discovering my wings as a young art student, I fell in love with a book called “The Zen of Seeing/Drawing” by Frederick Franck. It was filled with inspiring text and drawings about the experience of drawing itself. Over the years, though I may have forgotten about the specific contents of that book, the direction it fed has remained, such that I always regard drawing as a meditative experience. The way I see it (in life in general, and in drawing specifically) there is one main element to transcend – myself as a separated personality. And if you are into transcendence (as I am) it’s good to know exactly how that restricted sense-of-self functions. So there are two primary aspects to it: one temporal and one spatial. The temporal aspect is especially mind based while the spatial aspect is especially body based and although there are a million and one ways to transcend these limits, participating in timed drawing sessions of a naked human being is surely one of them. It provides a visceral impetus to concentrate temporally, into the moment, while simultaneously expanding spacially, into the other. In a certain way it’s that simple. 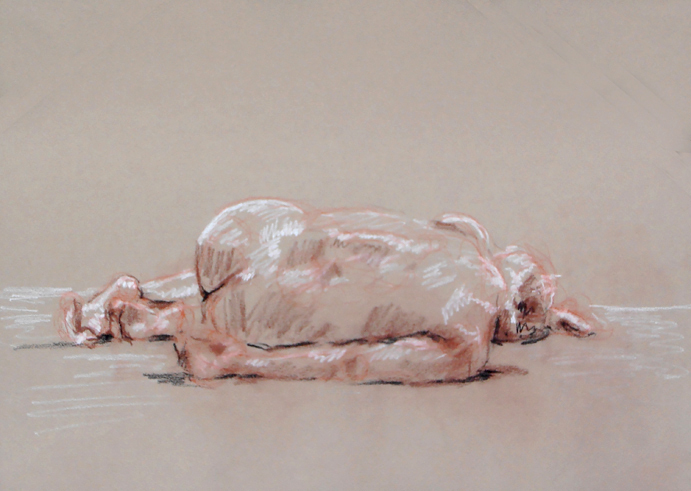 Figure Drawing #32. Pencil and white conté pencil on warm gray pastel paper. 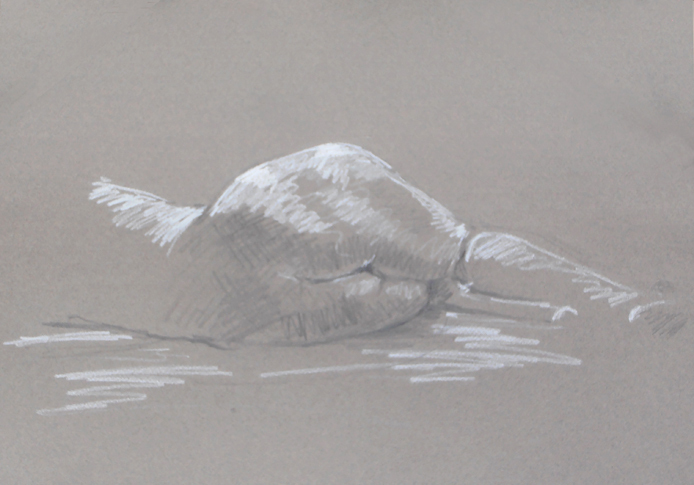 Most of the time figure drawing sessions are very open situations. There is a studio space and a model. Everyone chips in to pay the model’s fee. No guru, no teacher. Usually also there is a loose structure for the number and duration of the poses. And that’s it. It’s really about chopping your head off (in order to avoid drawing from some preconceived kind of place) and getting into your tactile body. Feeling the paper, feeling the chalk, feeling the model (as yourself), letting go and staying aware. Sometimes I don’t look at the paper at all, content with just feeling the chalk explore the contours of the model’s body. Sometimes I wait to feel the model’s pose in my own body before I start. Where is the weight? Where is the movement? But then, also, what is happening on the paper? Seeing the model there, watching the figure taking shape. Feeling its life coursing through my fingers. Additionally, drawing in this way isn’t about achieving some external standard of “likeness”, rather it’s about discovering your own authenticity. It’s about making footprints in the sand: remnants of a journey whose importance far outweighs it’s trace. 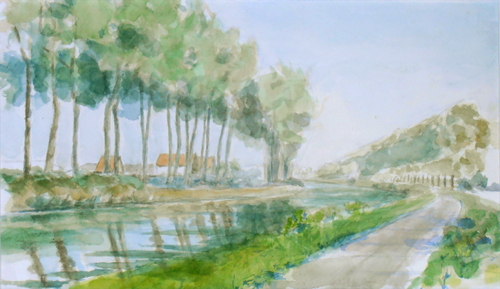 In early July this year I created a watercolor of a view along the Damse Vaart nearby Bruges, just in front of where the steamboat, the Lamme Goedzak, docks. I really liked the composition created by the canal stretching out into the distance, as well as the light of the evening as it progressed. By remaining in one location for a few hours, just painting, just watching, I could let the scene tell me precisely which light to try and capture. The sun was slowly setting in the west (here in midsummer, it doesn’t completely descend until almost 11:00 p.m.), so although the composition in terms of land, trees and water did not change, the light on them certainly did. I snapped a few photographs of the different transitions as I made my choice. Two months later, after a rainy August, one month’s holiday and tons of other stuff inbetween, I had the chance to do the imprimatura. I mixed up a blob of burnt umber tube oil-color with retouch varnish (1 damar to 2 turps). I painted it on, letting it absorb into the panel for about a minute and then wiped it back off. It left a thin veil of warm brown over the whole image. With another small brush dipped in turpentine, I began wiping the brown tint back off from the pre-painted highlighted areas. Within fifteen minutes the process was complete, the highlights jumped out and the shadows pushed back, both filled with descriptive details and vibrating with life. I was tempted to call it done. Nevertheless, the following year I decided to finish the piece – in the studio. I covered it with a tinted glaze of bunrt sienna and painted directly into that, wet-on-wet. This kept the wood areas vibrating with additional warmth and the greens and the blues well grounded. The challenge as always was to mix an array of receding greens to describe the distance. When it was dry I brought some highlights back in using tempera white (zinc white mixed with emulsion). Some of those final highlights required a little glazing just to bring it all back in balance. The resulting painting had a lovely color vibe, the red warmth of the wood contrasted to the greens (and yellows) of the vegetation. Green with envy – or was it ivy? 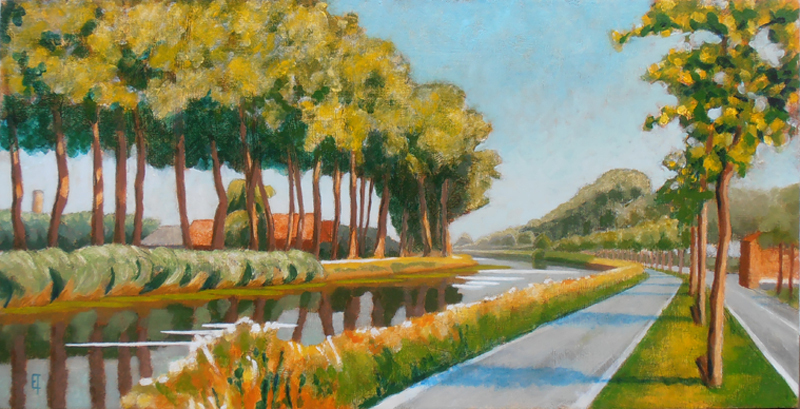 Kruispoorte version #1, 2009, a lovely painting but perhaps the development of the greens was a little flat. 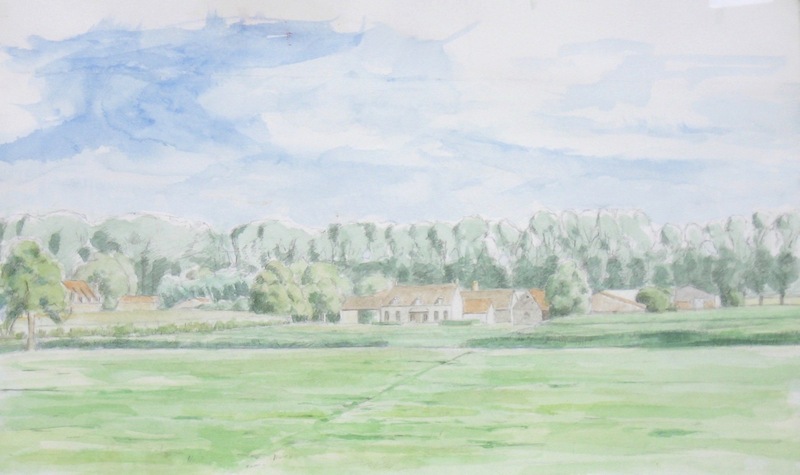 Anyone who attempts to paint landscape has to deal sooner or later with the problem of green. Of course, some might not even consider it to be a difficulty – but I do. So what’s the problem? In a nutshell: #1) the profusion of greens in the natural world contrasted to #2) the difficulty of rendering them to any degree of accuracy on the pallete/canvas/panel. 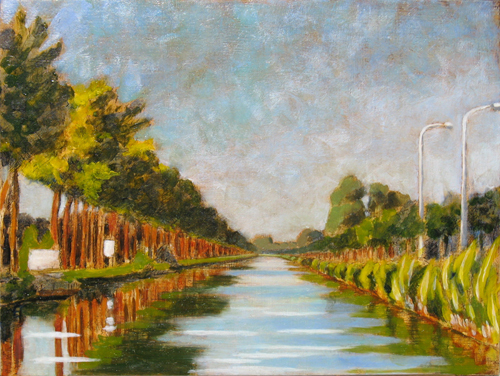 Kruispoorte version #2, 2010, blue level, I'm struggling with my differentiations here. From a pigment point of view, there are relatively few tube greens out there in contrast to the wide arrary of tube choices for other colors. Viridian, the strongest green pigment, is widely used, otherwise if you need something different, you just mix it up from some combo of yellow and blue, or even yellow and black. However, if you attempt (as I do) to arrive at a beautiful green through color layering (for example, a blue glaze over a yellow substrate) then you might indeed create a wonderful green, but find yourself unable to modulate it very much to it’s other (very green) surroundings. Hence an indirect technique for color development is a bit too inflexible. Kuuispoorte #2, 2010, brown glaze level, a solution of sorts. Thus, my current approach, to painting in general, but also to green in particular, is to minimize my pigment choice, decide on an approach and then modulate my color relations to it. For painting greens, this can mean using or mixing a master green, modulating a master chartreuse, blue green and/or gray green from that. Then tints and shades from each of those. If I am painting wet into wet, then the color of my glaze will certainly have a direct (color) effect. If it is an earth glaze (umber or sienna), the effect is quite grounding (no pun intended). Nevertheless, color is absolutely relational (a la Josef Albers) and nowhere is this more true than in the attempt to render the multitudinous greens of the natural world. My theory of painting is simply this: travelling has to be at least as interesting as finally arriving. It helps to have a numinal idea of what arriving should actually look like, but it wouldn’t be “art” if I already knew, would it? Thus, I always experience a certain kind of hesitancy as I approach the final levels in a painting. Do I really want the journey to end? Will this level “do” it? Or will it need more? And if so: what, where, how? Will the final image end up looking like a bored adult in comparison to its earlier youthful promise? Should I have stopped at some earlier vantage point along the way and just grabbed the ‘chute? Additionally, imposing a chromatic structure on image development allows for lots of lateral exploration at each level of additional color. Or to put it in even simpler terms, it helps me to control chaos. Chaos of my own emotions and my emotional reactions either to the subject matter or the developing image in front of my nose. But too much control results in lifelessness, too little, and it’s just chaos. Riding the surge of that inbetween space, of that wave, is richly rewarding: both exhilirating and terrifying. Committing myself to it involves a kind of surrender and also a kind of trust. If I imagine that the landscape I paint is essentially external to me, if I imagine that the paints I use are essentially “other”, if I imagine that the world itself is not a part of me and myself a part of it, then there is fear. Well, OK. Since I started documenting this current production series with the yellow level, I thought I’d continue with the red. Usually, when I trace the development of a painting through its different stages, the thread is the image. But this time the common denominator is color. So, its a different focus, a different challenge. Comparing chromatic qualities instead of developmental ones. The Sint AnnaKerk piece is shifting towards purple now. This seems to be due to the combination received through the massive amounts of warm gray tints that I worked into the crimson lake (red) tint. The church was a lovely yellow but I decided it needed a darker more massive tonality in order to provide enough contrast and mass for the strong highlights on its right side. I used clear glaze to eliminate the red tint from most of the green areas. The composition does not have a lot of strong color statements, so it’s interesting to attempt to pull out whatever is possible. 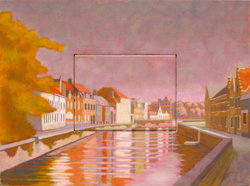 The Predijkherenrij Grande has a strong value composition containing a lot of colors. The red level was a marathon session of 14 hours, working the paints in before the medium dried. Applying the tint, erasing the same from the highlights and some greens and then building up the masses with (mostly) semi-opague tints of warm gray and lead white. Strong reds, yellows and oranges were restated with emulsified pigment. It feels quite hot now, doesn’t it? 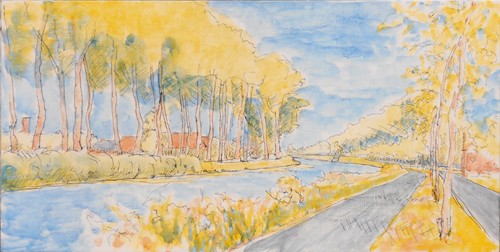 The concept for the Kruispoorte Grande was simple. Could I take the process-color studio painting technique out into plen air? The yellow level had worked out great. But the red level presented challenges because the composition itself doesn’t have a lot of strong reds in it. I found myself making choices between value (warm gray tints) or hue (yellow) statements: always keeping the overall composition in mind. Still, I’m not at all sure this will be a successful approach. Time will tell. It isn’t often that I have numerous paintings completed to the same level at the same time. However, since I am preparing for an exposition and have entered into production mode on a number of pieces, right now I have four paintings drying in their yellow stage. There is something particular and special to be seen in these “monochromatic” stages which soon will be integrated into full blown colorful images. It is a curious level, one of overall hue reduction, of lowered value contrast too, of subtle nuances and above YELLOW, contrasted against gray (which of course becomes pushed towards its complement, purple). The underpainted hues that have been developed in the egg tempera stage shine through subtly, as gentle reminders of potential futures, still yet to be heeded or ignored. Who can tell? Even an abstract background that I know is intended to become a “blue” sky will have elements of the sun’s yellow light within it. If I state it now, it will always be there, ready to rise to the occassion by the brush’s trumpet call. Thus, succcessive stages build back upon the basic statements made in the yellow layer. 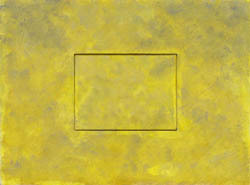 Warm reds and vibrant greens depend upon a good solid yellow. Yet sometimes, I find myself satisfied with the yellow layer just as it is. Fini. Perhaps it’s only my insatiable curiosity which keeps me wondering about what’s round the next bend, keeping me from lingering with the yellow level and just calling it “done”. So, I document it here: an interesting level, worthy of note, even if today it’s only electronic. A rose by any other name: “mische technique” or “mixed method”? Recently, I surfed around to see if I could find information relating to a painting process I use which I’ve always called “the mixed technique” or “the mixed method”. I didn’t find much info (in English) using that term, but got a lot more results when I used the term “mische technique”. Although “a rose is a rose is a rose is a rose”, I can see that people who want to inform themselves about this particular process of indirect painting could very well find themselves confused (which I have been), not only about the name, but more importantly about its properties. So I thought I’d try to post what I know. Maybe others will be drawn to share their knowledge? Thus, there appears to be a very specific application of indirect painting currently called the “mische technique” or even the “mischtechnik” (from Wikipedia). It’s described as an attempt to reconstruct the methods of the early Flemish masters by using “egg tempera to build up volume which is then glazed over with oil paints mixed with resin to produce a jewel-like effect”. The contemporary painters Ernst Fuchs, his student Brigid Marlin and the Society of Art of Imagination seem to me to be the most active exponents of this particular method. Although I’m not sure that the Flemish masters used Red, Yellow and Blue for their imprimatura-undercoats (as it is described on a Brigid’s website) nevertheless, their “mische technique” process appears to be highly effective for luminous, surrealistic Dali-esque imagery. If you are drawn to both this kind of subject matter and this manner of execution, I suggest you check out their links. Yet the super realism of the “mische technique” – as it is presented on the web – is not really my thing. I tend to be drawn to softly abstracted, beautifully modulated, luminous landscape. 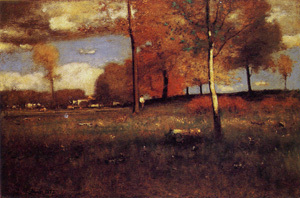 Think: George Inness. Think: Tonalism and Luminism. Thus I am deeply drawn to a method of indirect painting which takes advantage of building up an image through multiple layers of paint, allowing for transcendent effects of both light and color. And I use something I call the “mixed method” or “mixed technique” to achieve that. The process I know, which was taught by Nicholas Wacker at the Ecole des Beaux Arts in Paris during the nineteen sixties and seventies, is also called “the mixed technique” or “mixed method” . It, too, is touted as a reconstruction of the methods of the old masters, although I tend to think its application extends far beyond the precise realism of the Flemish school and the modern surrealists of the “mische technique”. The main aspect of this method is the mixing of an emulsion of water and oil which allows for lean, siccative image development through multiple layers of paint: the essence of an indirect technique. It also allows for soft sensuous blending (without contamination) of adjacent color areas (really luscious wet on wet effects). It demands a well considered composition with interesting value development so that you have a good idea of where you intend to go. Nevertheless, many surprising chromatic events occur during the act of painting, making each “alla prima” session an exciting, challenging process of discovery. So is the “mixed technique” fundamentally different than the “mische technique”? No, not really, but instead of egg yolk, alcasit (a methyl cellulose glue) is used to emulsify the painting emulsion – thus there is a longer shelf life. Additionally, high quality, lean, tube oil colors can be used and mixed with the painting emulsion. This has the effect of enhancing the flow and siccative qualities of the tube paint, without forcing the laborious work of grinding each pigment into emulsion in order to create paint. The side effect of that being an extended range of quickly available colors along with the acknowledged down side of a probable reduction in the number of layers of paint that are finally possible. Thus, the rule of fat over lean always applies, yet its law can be greatly extended. 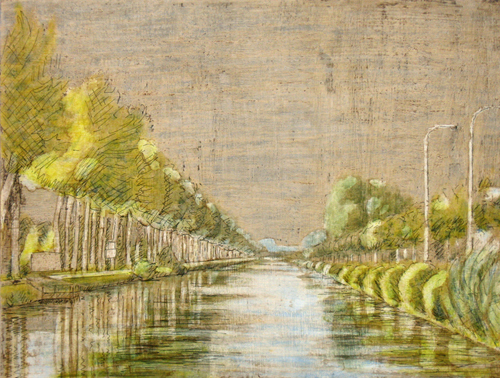 The bottom line: the term “mixed” or “mische” refers to the mixing or extending of a water based medium like that of egg tempera into the region of oils – and vice versa – that is, limiting the oily quality of an oil paint through applying resins and emulsion so that it, too, can more easily interact and receive the benefits of the leaner application of a water based paint, like that of egg tempera.